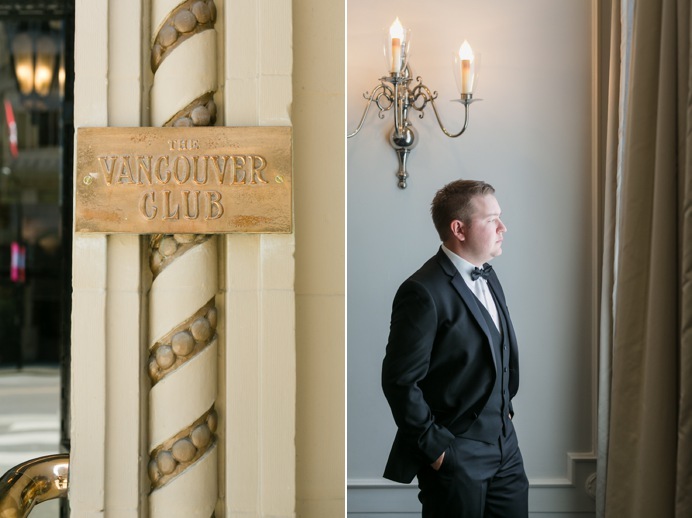 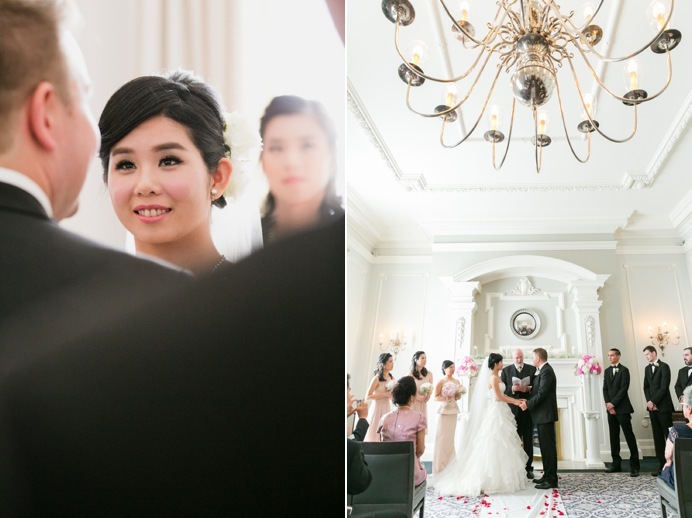 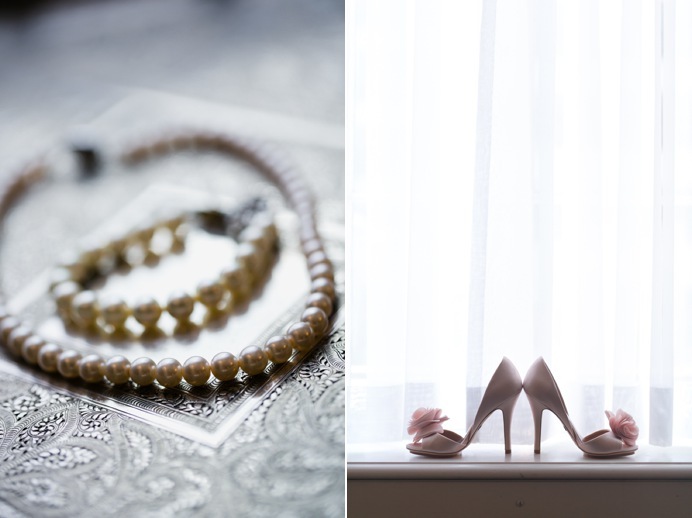 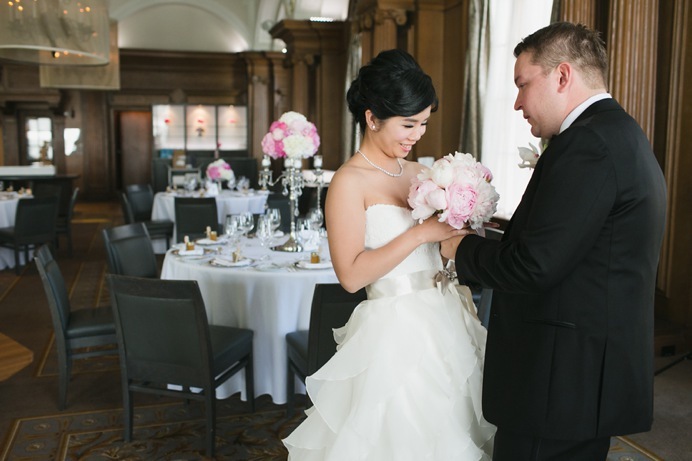 Alice + Jon celebrated their Vancouver Club wedding on a beautiful Spring day this year. 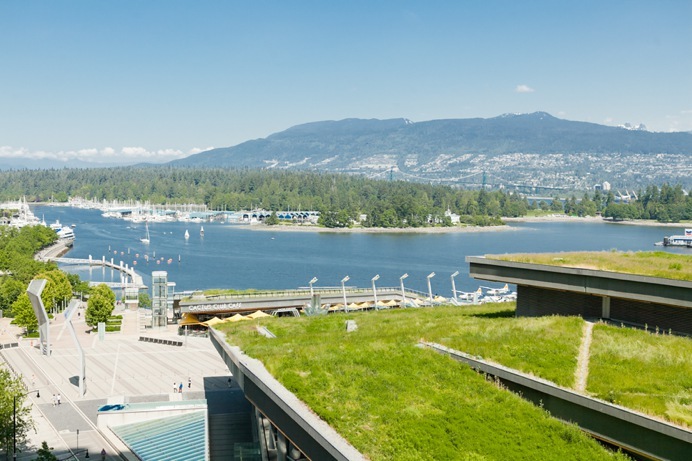 It was one of the first good days of the Spring and the day was perfect in so many ways. 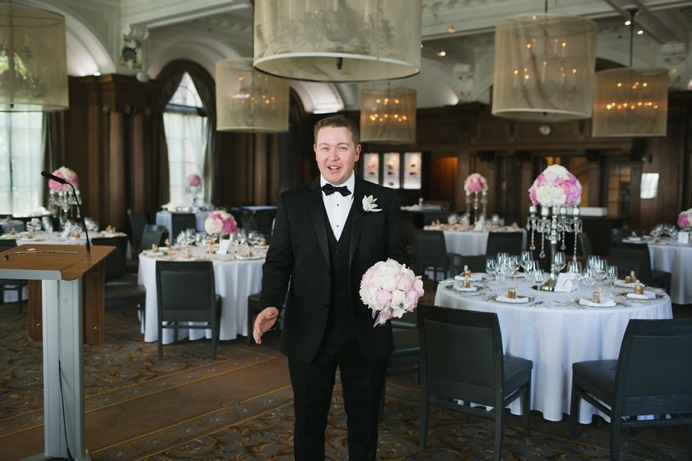 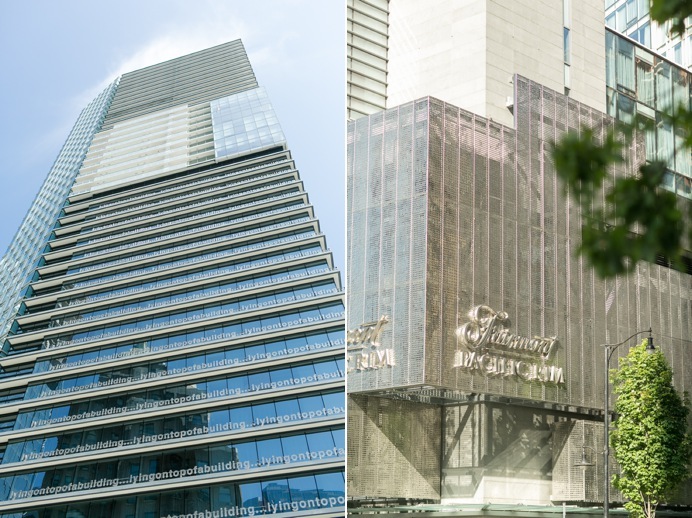 Jon started his day at the Fairmont Pacific Rim hotel, which is just one block away from the Vancouver Club, where they would host a ceremony and wedding reception. 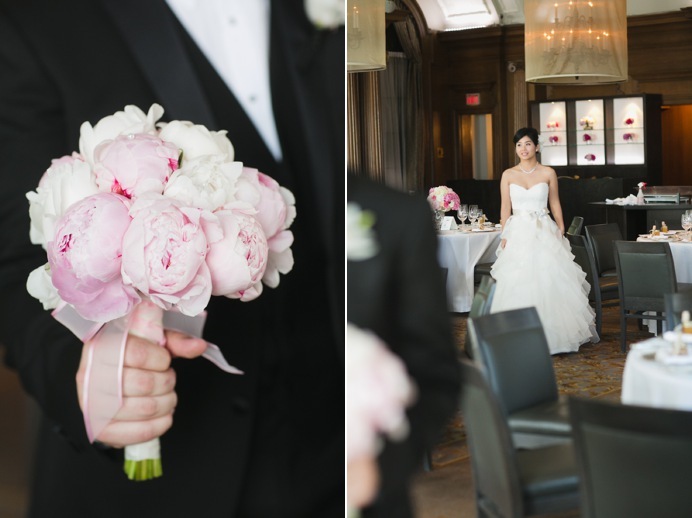 Alice spent her morning at the Vancouver Club getting ready for both a Chinese tea ceremony and a civil ceremony. 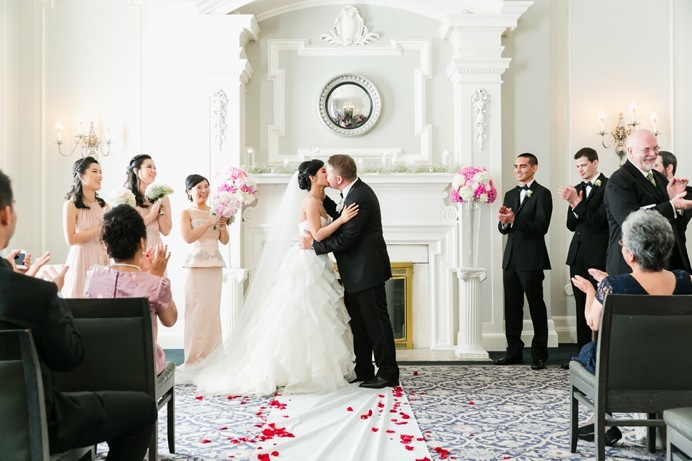 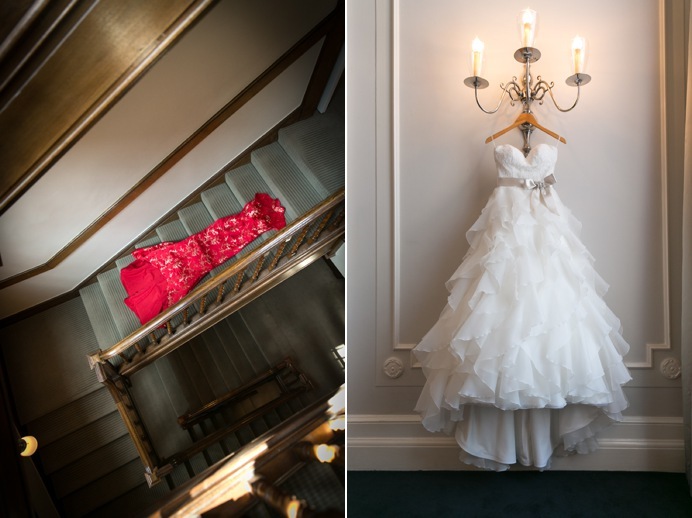 Alice had a Chinese red dress (cheongsam) for her tea ceremony and a white dress for her Western civil ceremony in the Georgian room of the Vancouver Club. 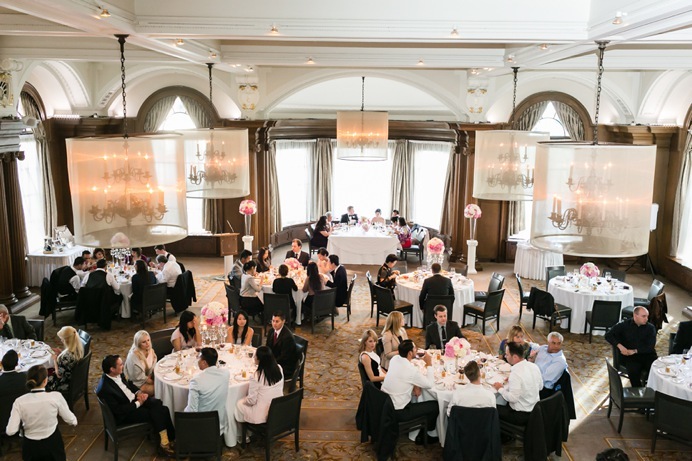 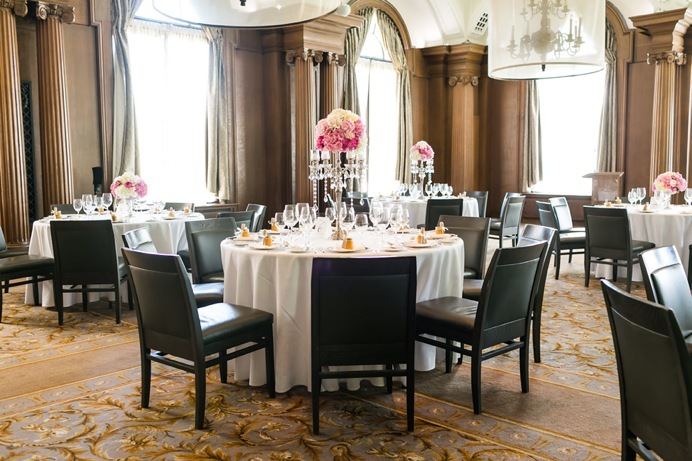 The Vancouver Club ballroom looked timeless and sophisticated as usual. 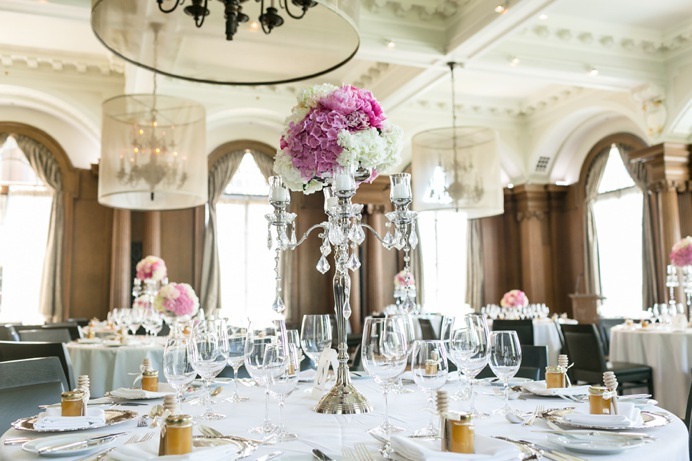 Vancouver’s Sunflower Florist created the beautiful candelabra centrepieces. 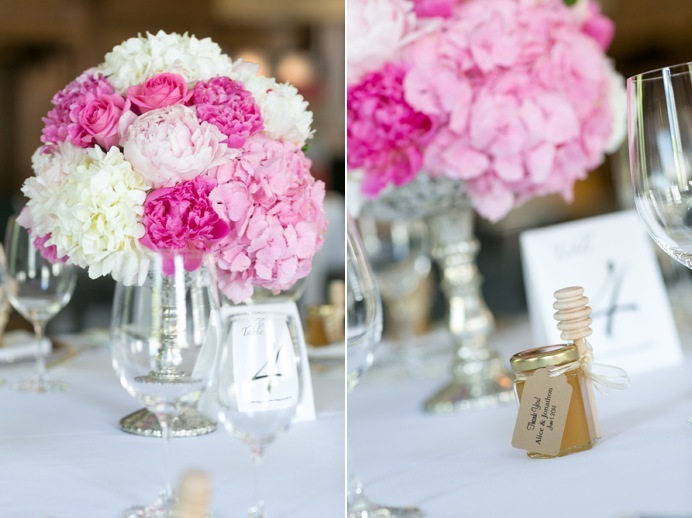 For their wedding favours, it was a bottle honey for their guests. 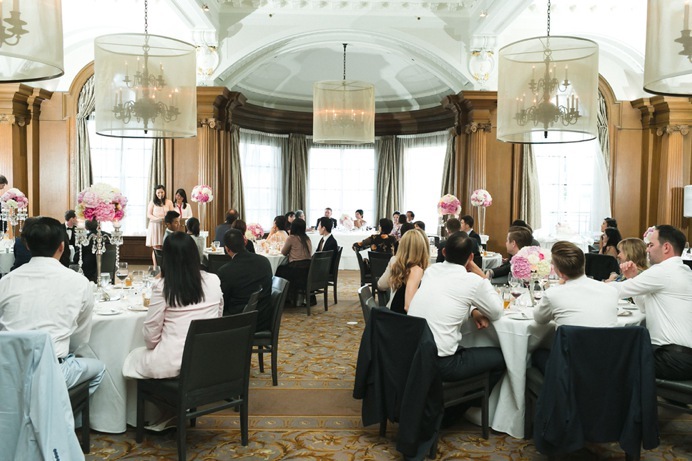 And Alice + Jon also provided a number of film cameras for guests to use through the day. 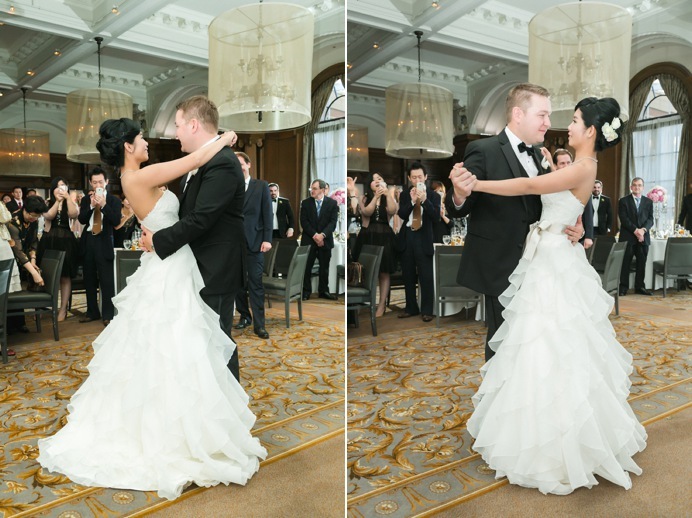 The first look with Alice’s wedding dress happened in the ballroom. 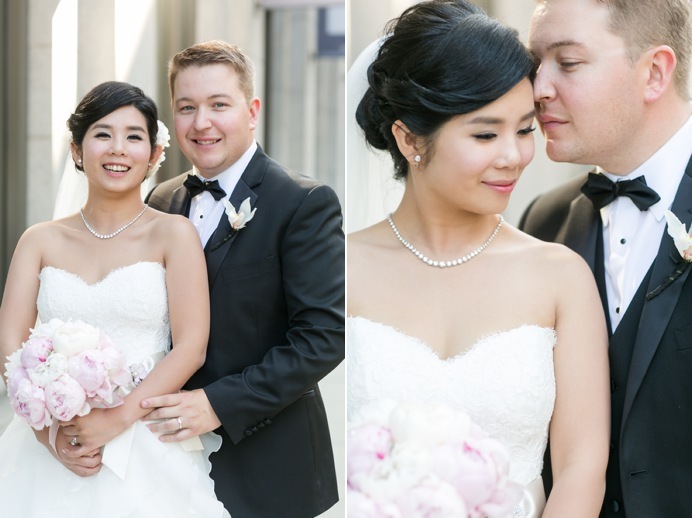 Jon couldn’t hold back his emotions as he saw his bride in their dress that afternoon. 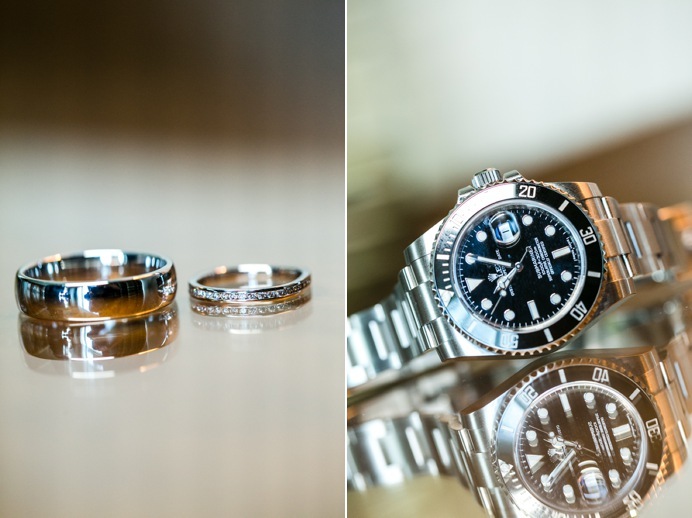 Shortly after, we walked around West Hastings and the Vancouver Convention Centre for more photos with the bride and groom. 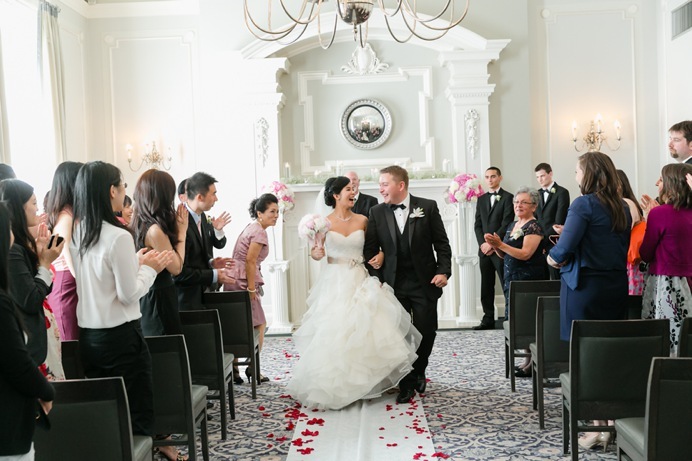 There were so many occasions where we photographed some really great expressions of joy from the bride and groom, but the recessional photo below after the Vancouver Club wedding ceremony has got to be one of my favourites without a doubt. 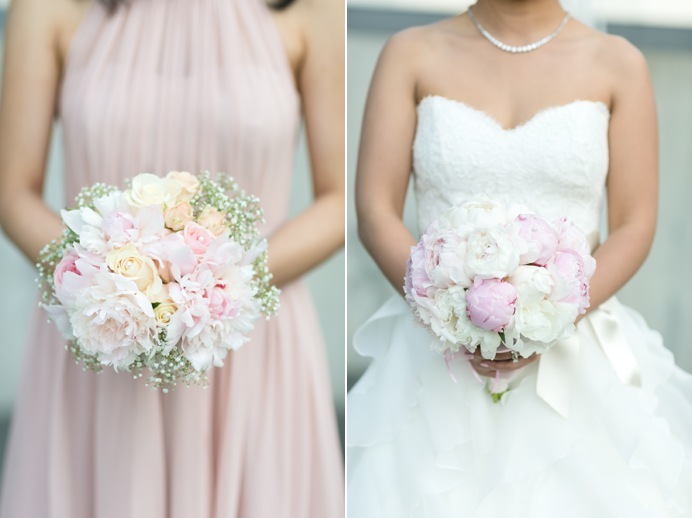 Wedding flower bouquets were crafted by Sunflower Florist. 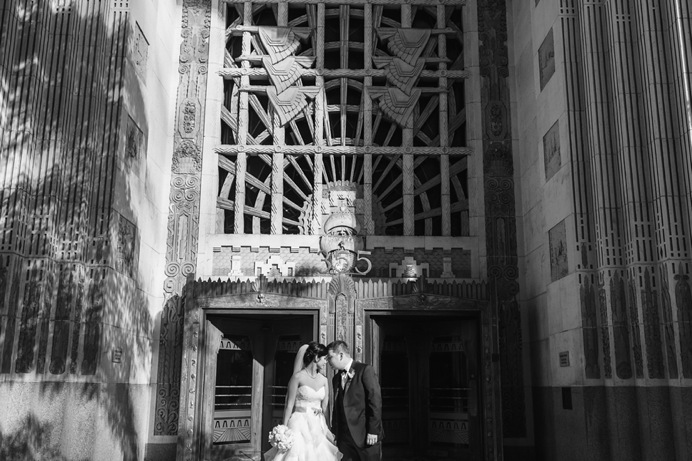 The grand entrance was a emotional as the rest of the day had been. 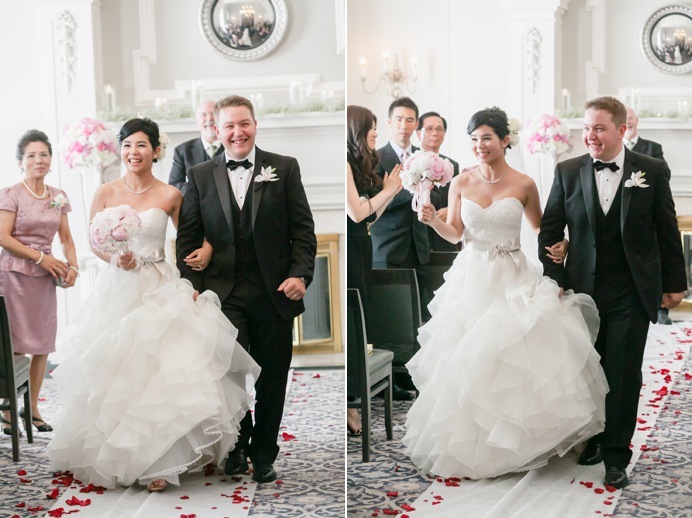 Both bride and groom came into the room laughing, dancing, and waving to eagerly waiting guests. 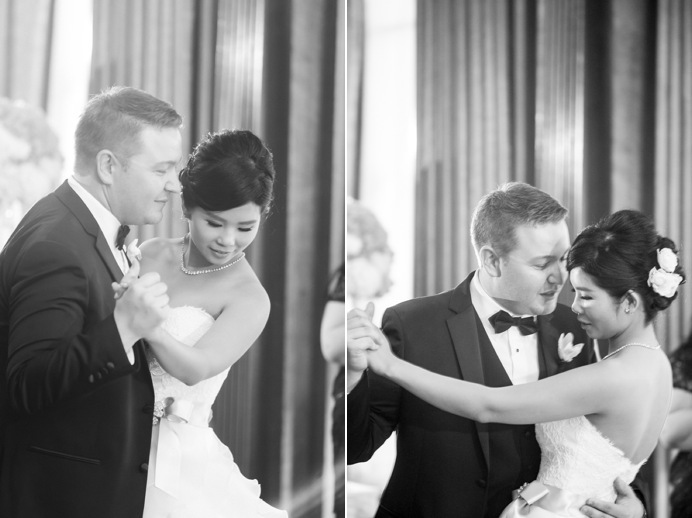 It was a special moment, and they took advantage of everyone’s attention by kicking things off with a first dance. 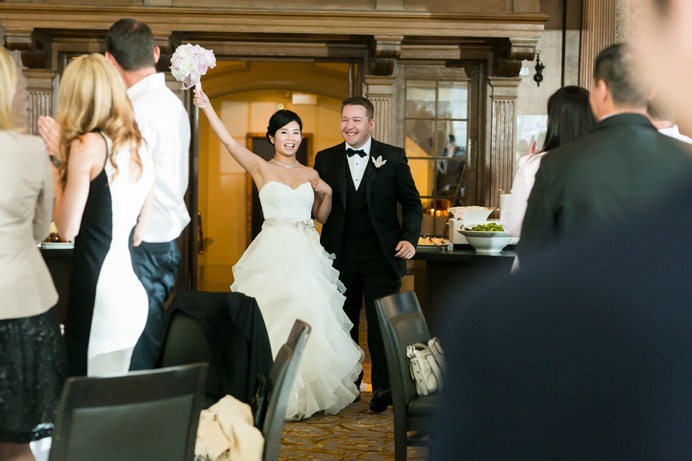 Congratulations again Alice and Jon! 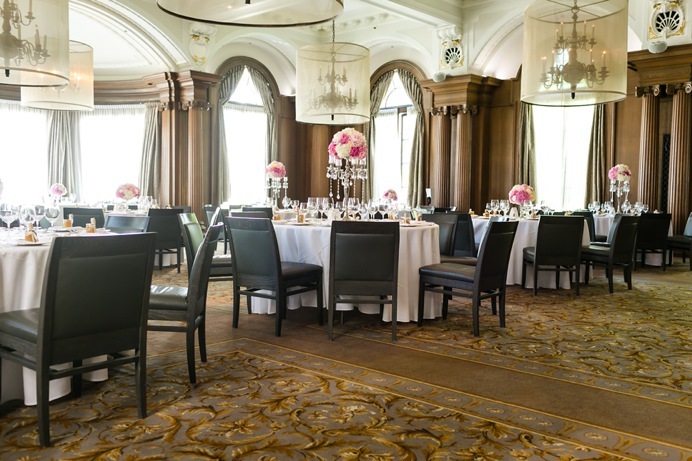 I love the decor for this wedding! 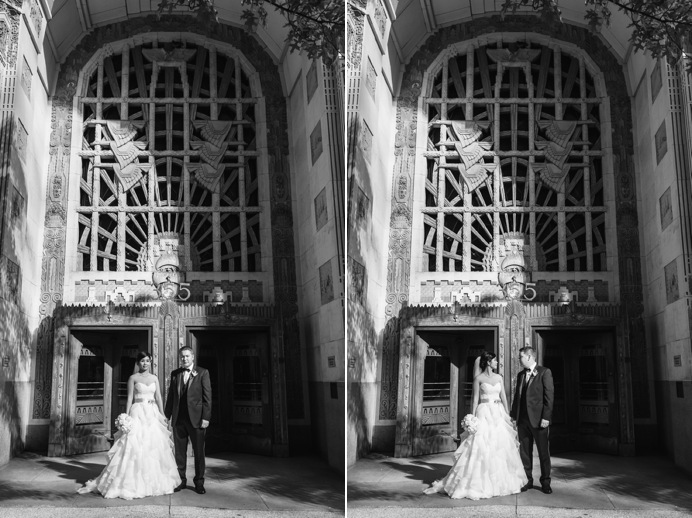 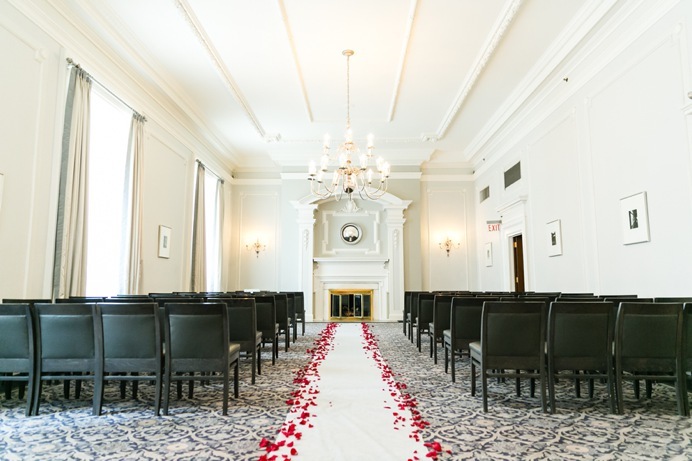 It matches this timeless venue perfectly!